(Mens Snug XL) Ugly Xmas Sweatshirt! Dr. Seuss! The Cat in the Hat in a Wreath! Home > Ugly Christmas Sweaters > Ugly Christmas Sweatshirts > (Mens Snug XL) Ugly Xmas Sweatshirt! Dr. Seuss! The Cat in the Hat in a Wreath! 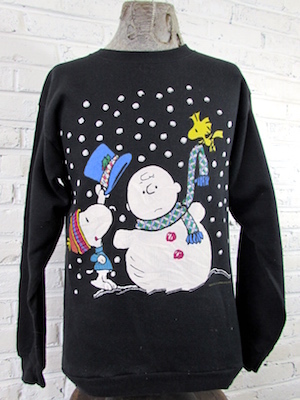 Vintage 90�s ugly Christmas sweatshirt! Navy blue sweatshirt with Dr. Seuss' iconic The Cat in the Hat in a wreath with holly tucked behind his ear! Tagged by Dr. Seuss. 100% Acrylic. Sleeves: 28" collar to cuff.